Well last weekend was one of those reminders of how special Vancouver is. Flat calm seas in our local waters, great guests, sun in the sky, chinook, prawns, and lots of laughs. It is these kind of days that make up for all the 40 knot winds and sideways rain! Speaking of rain, it looks like we are back to a mix of sun and cloud as the weekend approaches, and of course some rain. I will take the rain though, don’t forget about January 2017 when boats were frozen in their slips. It was so cold people were ice skating in Lost Lagoon the first time in 20 years. So rain, no problem and lets go fishing. Jason’s guest Paul holding up two nice chinook from Sunday taken in the flat calm waters of Howe Sound. The fishing has been pretty good too. All the spots are producing fish, from Vancouver Harbour up to Howe Sound. The “Harbour” was particularly productive for quite a few boats on Saturday but seemed a little slower on Sunday. We were out mid-week in the Harbour and Howe Sound and had solid fishing. Our newest member of the guide team, Derek Puri, got his client Alan into some nice fish mid week. Derek grew up fishing Howe Sound and we are excited to have him on our dock. As for guest Alan, clearly he is bundled up, but we can’t blame him, he is visiting from Australia! Prawning has also been very consistent. We have been dropping traps on all our 8-hour charters with great results. It is a great way to cap off a day on the water. A nice haul of BC Spot Prawns. A big shout out to Colin and his crew who came by to say hi when we were pulling our traps. Thanks for the taster of fresh spot prawns with garlic butter and basil. Amazing! The hot gear this week in the clear water has been what I call the dark side, darker flashers and spoons. The top flashers have been black and purple UV blades. Our top producers this week have been Purple Phantom, CB-55, and Black Pacific Angler Custom. For spoons it was all about the Herring Aide. It was deadly in the Kingfisher 3.0 and 3.5 and the Skinny G. If you are fishing in slightly coloured water off the Bell, you want to get the brighter gear down. For flashers fish STS, BC, Chartreuse or Green Pacific Angler Custom and brighter spoons like the BC, Outfitter, Irish Cream, and Yellow Tail in G-Force or Kingfisher. I should note that bait has also been a good producer, especially in the clear water on a UV Chartreuse or UV Purple Rhys Davis anchovy teaser head. 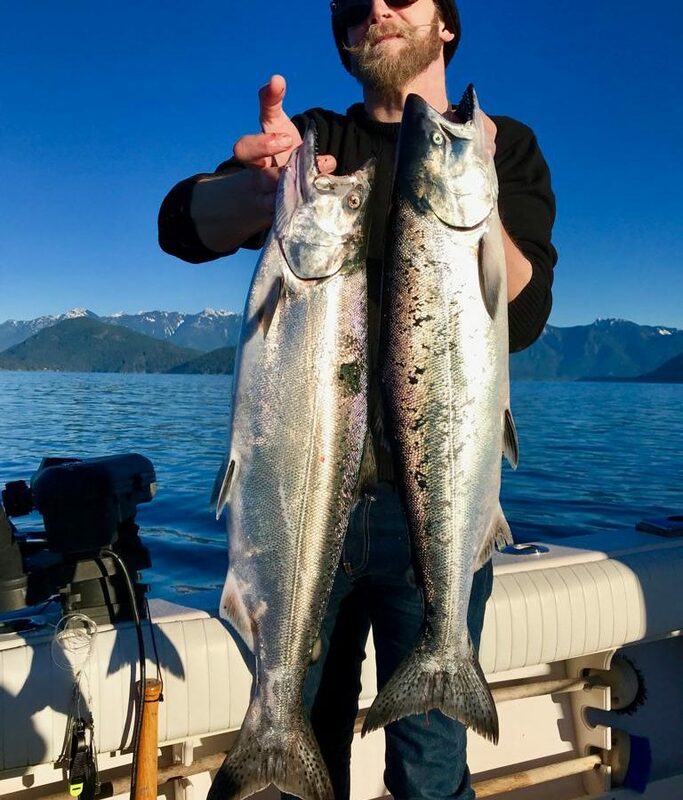 If you are thinking about booking a trip, now is the time, we just announced our Winter Chinook Special Rates, the fish are in and the prawning is great.